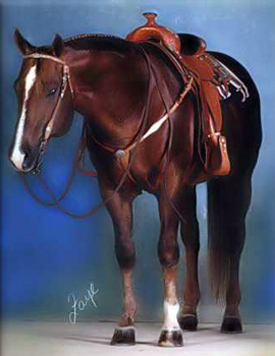 "Zip" is an own son of "Zippo Pine Bar," who was the leading sire of AQHA performance horses from 1988 - 1997. 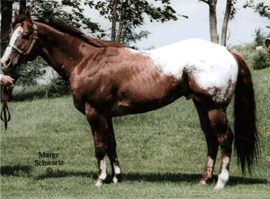 This bloodline is foremost in the majority of pleasure horses today. 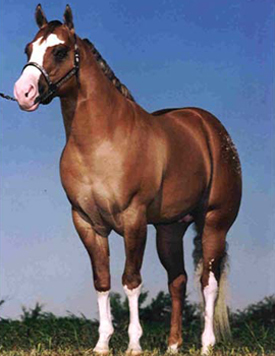 Zippos Country Cat was a stallion that passed his many desirable attributes on to his offspring. We have kept many of Zip's fillies and are now breeding them to Secret Admirer with outstanding results. Keep watching for the "Zippo" disposition and movement to live on in his grandkids! In September of 2000, Tim King suffered a broken leg and had to be put down. He is the cornerstone of our breeding program and was a big part of out lives. His wonderful disposition will live on in his offspring. TK's offspring have proven themselves in a variety of ways. They have been awarded high-point North Dakota bred Jr. Horses, used as all around youth and non-pro horses, won numerous futurities as babies, used as ranch horses, trail riding, and excelled in team penning and dressage. He was known for the quiet disposition that he passed on to his get. Greatest son of Spittin Image. As a weanling won all 11 of 11 shows, Grand Champion yearling over all studs, Grand Champion/Hi Point in several states. ApHC Champion/ROM Halter/Pleasure Slelct Sire Halter & Performance Champions. World & Reserve World Champion Offspring. Hi point, Superior, ROM Offspring. Sire of greats such as Rockin' Jack who has over 300 Points in 14 events and was World Champion Pleasure/Trail. Offspring being used from halter, to pleasure, to games! Sidney sires halter champions that ride! !